hotcoffee: Players feel free to add your name and add a move. 84: Alex: I think we're thick enough to tenuki. Furthermore, I'm still not willing to give up hope of an attack around here. 85: jwaytogo: Let's have the cake and eat it too! jwaytogo: Created a new board, same as usual. Maybe I will play a move, but will need to think some more. 71: jwaytogo: Ok, played the simple solution. 72: QWerner: May be also the simple solution. 76: Alex: It's slightly tricky reading, but I believe this connects our groups and also prevents much more intrusion into our territory. 79: HolIgor: Just to keep the game going. 80: Alex: Also trying to keep the game going. 62: Alex: This seems to fix our cutting points and shouldn't be too bad for our shape if we answer kikashi skilfully. I know I'm not supposed to play two moves in a row, but I'm trying to keep the game moving. 66: Alex: I'm a bit concerned about the health of this group. This should keep it nice and safe, and is not small in terms of territory. As usual, I also have some ulterior motives. 70: Alex: Whatever happens next, I don't think we can afford to let Black play here. 51. jwaytogo: I see this as a good "turn" of events. 54. Alex: I think the 52-53 exchange was a mistake for us. I'd like our position better if we still had the option of the other atari. Either way, I think we still need this connection. Letting Black get the double atari and trying to squeeze is not likely to turn out well for us. 58 ( ) DJ: Uhm, White lost something on this side, and two keima jumps make me uneasy... Let's reinforce, slow as it is! 60: Alex: I'm not too happy with how things are going, but I'm not going to give up on getting some sort of splitting attack yet. There's also some defensive value to this. 41: GoJaC Feigning self-confidence, start running. Alex: When you play move 41, 51, 61, etc., you're supposed to start a new diagram. I've done it for you. GoJaC Ah, now I understand. So in a way you play on "two boards" at the same time. (I thought new board was created on move 40.) Alex: Yes. 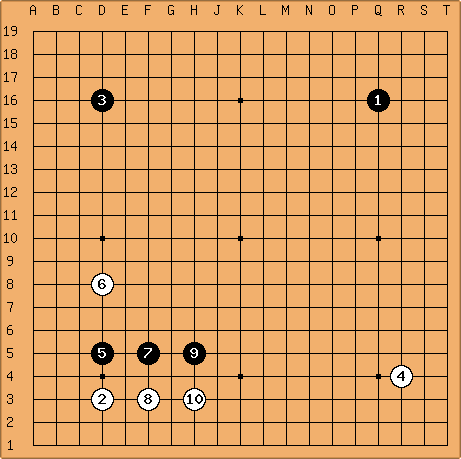 The top board is to show the current move only. 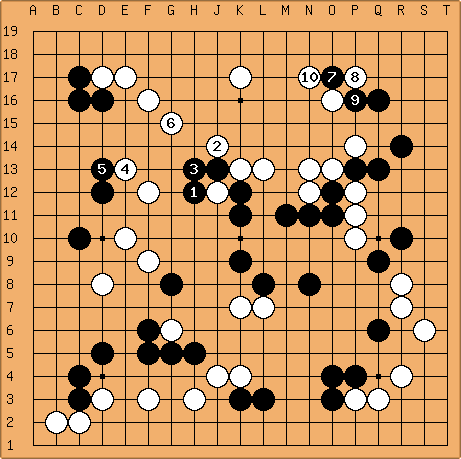 The boards below are kept (and a new board created every 10 moves) to keep a record of the game for discussion later. 46: Alex: Don't see any way to dodge, so I think there's no choice. 47: jwaytogo: Cut first, think later. Very sage advice. 48: unkx80: Atari first, think later. Also very sage advice. 50: Alex: Looks forced to me. 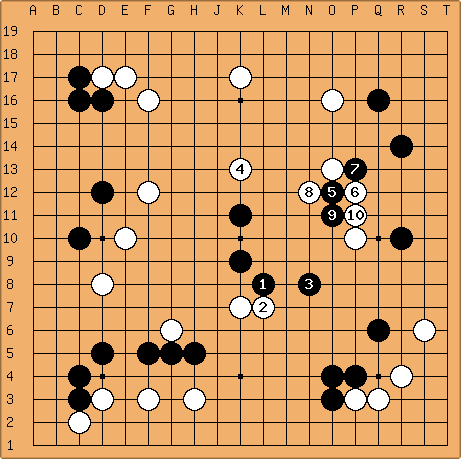 35: hotcoffee: Would not like to have to explain to my (hypothetical) sensei why I didn't automatically connect against this cut. 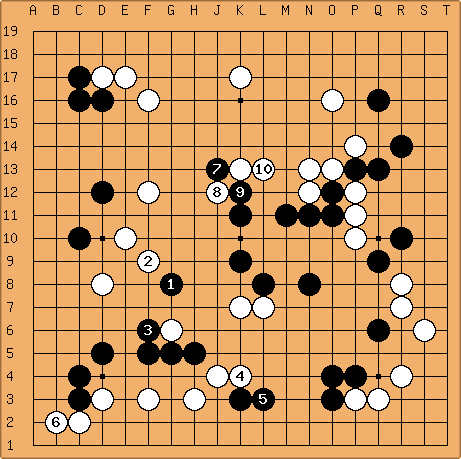 36: Alex: Would prefer not to get sealed into the corner in sente. QWerner: I was thinking about move 38. My choice would have been W K8. Can some one give me his thoughts about this move? 39: Definding the reduction stone, now that White stretches his sphere of influence, including a miai argument. 40: Alex: I'd really like to make Black heavy before attacking, but it's hard to decide which side to peep from and anyway, Black might not have to connect solidly. Therefore, I'm going to cap first and leave chances for kikashi later. 21: hotcoffee - trying to keep cool surrounded by dan players, second guessing myself a lot... intuition suggests the knight's move strikes the right balance here. 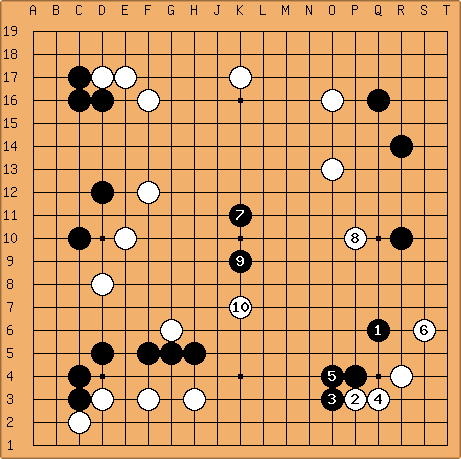 22: Alex - Seems like a useful kikashi on the road to light shape. 23: dnerra - connecting against peeps is one of the strong points in my game. hotcoffee - I'm glad it's not just me who couldn't find a move. 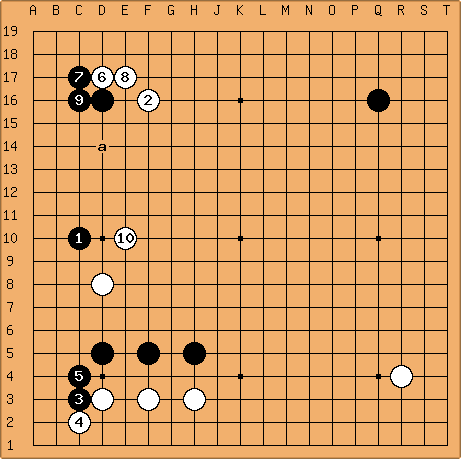 My best guess was the hoshi adjacent to your move, but i frequently err towards influence at the moment. Could a stronger player please comment? unkx80: I would think that 25 is in the wrong direction. Had 25 been played in the other direction, then White would have to worry even about the base of the stones in the upper left corner. When I meant I don't know what is the best play for 26, I meant I do not really know whether a move around a is better or another kind of corner approach is better. However, definitely the direction is in the upper side. Since I assess the situation to be unfavourable for White, I decided on the more aggressive 26. 26: unkx80: Me too have no idea what is the best play. 28: Alex: 27 feels like the wrong direction to me, so I'll tenuki. I think the top right is more urgent. However, I want a moyo, not the corner, so I won't make a double approach. This move feels good to me. 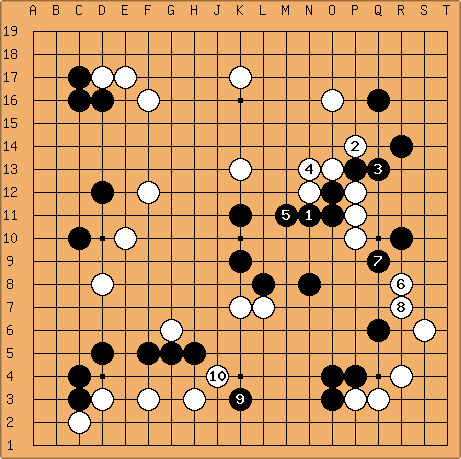 29: hotcoffee: There is great danger on the board, so the wrong move here could spell disaster - however black cannot risk another corner approach, possibly killing the hoshi, and certainly splitting it from 25. This move simply screamed at me to be played. 30: Alex: I didn't want to play two moves in a row for White, because it's kind of against the spirit of rengo, but it appears that no one else will and I don't want the game to die out. I think this, or one line below is pretty much the only move. 13: dieter: joining Black, who are shorter on dan grades. 17: JM: Hane, taking the 3-3. 18: Shaydwyrm: I don't like the looks of the crosscut, so I'll stick to the natural move. 19: dnerra: To huge to be omitted. kiebitzer? : very interesting position now! 1:hotcoffee - hoshi usually isn't bad. 3:jwaytogo - Two rising stars are better than one. 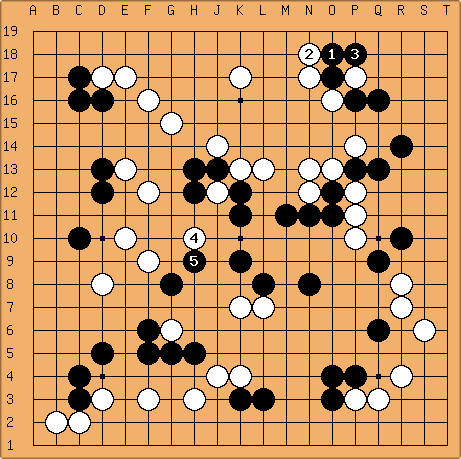 4:Alex - Territorial openings are common for White in games with komi. 6: Jared White is outnumbered 3 to two, both in stones, and players ... I'd better join up and play a stone to even things up. 7: invisigoth - hotcoffee says one space jump is never bad. 8: Shaydwyrm: Can't get sealed in the corner here. 9: JM - Joining in with a joseki jump. 10: Mef: One good jump deserves another. hotcoffee - I'm baffled by moves 8 and 10, but appreciate that they were made by players more than 10 stones stronger than me. Can anyone explain the reason why the one space jump was the ideal extension here? Would a two space jump for , or for allow black to peep and gain thickness? If was elsewhere (for example, settling ), would black have an intolerable advantage? Perhaps a subpage for the discussion of moves 1-10 would be appropriate. hotcoffee - Thanks for the link to the joseki page. My innocent mind had never been exposed to any more joseki than a simple "this is how to deal with a san-san invasion". Nice to see that my intiutive move 11 was well placed, even though it was badly timed by leaving some weakness under the black stones on the left.